Please note, Poplar Tunes is closed as of September 2009. 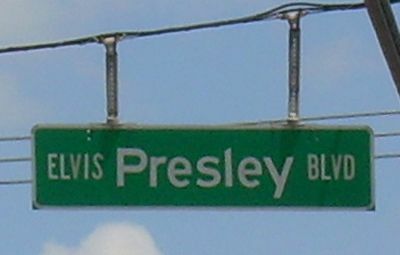 Elvis Presley is arguably the most famous and successful celebrity to come out of Memphis. He had 114 Billboard Top 40 hits and appeared in 31 feature films. To date, more than one billion Elvis albums have been sold worldwide. In spite of this international fame, Elvis managed to touch his hometown in a personal way. Ask any native Memphian about Elvis, and most will have a story to tell. It seems that everybody has crossed paths with the King of Rock and Roll in some way or another. A big reason for that is that Elvis truly lived in Memphis. He enjoyed the city and experienced much that it had to offer. Come with me on a virtual tour of Elvis' Memphis and see where the King lived, worked, and played. After Elvis and his parents moved to Memphis from Tupelo, Mississippi in 1948, they lived in a series of boarding houses and apartments. Their apartment in Lauderdale Courts, a low-income housing project, was the third such residence for the family. It is reported that they paid $35.00 per month in rent. They moved into the apartment in 1949 and lived their until 1952 when their income exceeded the maximum amount allowed. This apartment can now be rented for the night for fans who want to sleep where Elvis did. Take a photo tour of all nine of Elvis' Memphis addresses. Elvis attended Humes High School from 1948 until 1953 when he graduated. He was the first in his family to finish high school. While in attendance at Humes, Elvis gave his first performance in front of a crowd. He sang and played guitar at a talent show in the school's auditorium. To his surprise and delight, he won the competition. Today, the original school building still stands but Humes is now a middle school. In 1953, an 18 year old Elvis Presley walked into Sun Studio (it was called Memphis Recording Service at the time) with a cheap guitar and a dream. Nervously, he sang a demo song, failing to impress Sam Phillips. Elvis continued to hang around the studio, however, and in 1954, Sam Phillips asked him to sing again, backed by a band made up of Scotty Moore and Bill Black. After hours in the studio the small group had yet to record anything of any value. Just for fun, Elvis began playing around with an old blues song, "That's Alright, Mama." His rendition impressed Phillips and garnered him a recording contract. Poplar Tunes (also known as Pop Tunes) is record store located just a short distance from Elvis' Lauderdale Courts apartment. As a teenager, Elvis spent a great deal of time in the store, immersing himself in the Memphis music scene. As Elvis became a successful artist in his own right, it is reported that he would stop in Pop Tunes to find out how well his records were selling. Update: On September 10, 2009, Poplar Tunes closed its doors forever. Due to the success of his first #1 hit, Heartbreak Hotel, Elvis was able to purchase a home for his family. He bought this house in 1956 for just over $29,000. The three Presleys lived there for just one year when an increasing need for privacy prompted Elvis to buy Graceland. The Audubon Drive house still stands today and has had eight owners since the Presleys lived there. Coletta's Restaurant is a Memphis institution that first opened its doors in 1923. This Italian eatery claims to be the originator of the barbecue pizza. By many accounts, it was this very pizza that was Elvis' favorite. This is an interesting tidbit of information, as the King reportedly was not fond of barbecue, itself. There are now two Coletta's locations in the Memphis area. It is the one on South Parkway that Elvis frequented. Please note, the Gridiron Restaurant is now closed. The Gridiron Restaurant was one of Elvis' favorite eateries. There are several reasons for that. First, the Gridiron is located just down the road from Graceland. Second, it is open 24 hours a day, which made it a perfect destination for Elvis' middle of the night meals. Thirdly, the Gridiron fixed a cheeseburger just the way Elvis liked it: thick, juicy, and smothered in three slices of cheese and accompanied by lettuce, tomato, and onion. "The Zippin Pippin was Elvis Presley's favorite ride. The "King" rented Libertyland August 8, 1977 from 1:15 am to 7 am. to entertain a group of about 10 guests. Decked in a blue jumpsuit with black leather belt, huge belt buckle with turquoise studs and gold chains, the "King" rode the Zippin Pippin repeatedly during a two-hour period. He lost his belt buckle on the ride that morning, and it was found and returned the next day. Elvis's Libertyland rental became his last public appearance. He died August 16." In 2005, Libertyland closed its gates, citing financial difficulties. The Zippin Pippin was finally sold to an amusement park in Wisconsin and is no longer in Memphis. Graceland was the last of Elvis' Memphis homes. It is where he died and it is where his body was laid to rest. Elvis bought the home in 1957 for $102,000 from Ruth Brown Moore. In April of that year, he, his parents, and his grandmother all moved into the mansion. After his mother's death in 1958, his father and his new wife lived at Graceland for a while. Priscilla Presley also lived there for a ten year span before and during her marriage to Elvis. On August 16, 1977, Elvis was found dead on a bathroom floor inside Graceland, apparently due to an overdose of prescription drugs. Elvis was originally buried in Forest Hill Cemetery in Memphis but after someone attempted to steal his remains, his body was moved to the Meditation Garden at Graceland. Today, Graceland is the most popular tourist attraction in Memphis, drawing hundreds of thousands of fans each year. It is one of the most visited homes in the United States, second only to the White House.